October 28, 1988. From Bosenberg Creek to the Malheur National Forest boundary. Wild — 6.7 miles; Scenic — 7.0 miles; Total — 13.7 miles. 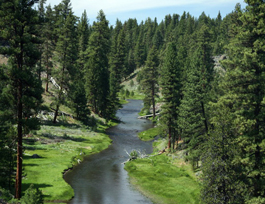 The Malheur River is located in eastern Oregon with outstanding scenery, geology, wildlife habitat and history. The river corridor is generally characterized by a rugged and steep canyon ranging from 300- to 1,000-feet deep. The canyon geology is evident in the various rock outcrops, talus slopes and cliffs, contributing to the scenic diversity of the landscape. Scenic vistas from the canyon rims and views up and down canyon from the river are spectacular. Wildlife habitat in the canyon is relatively undisturbed with a diversity of high-quality habitat components, including old-growth tree stands. The river corridor also provides important connectivity between the Blue Mountains and Great Basin physiographic provinces. The historic value of the river is its early day logging history evidenced by an old splash dam, logging camps and high-stumps. The river provides a variety of recreational opportunities for visitors willing to travel to its remote location, including trout fishing, hiking, horseback riding and camping.